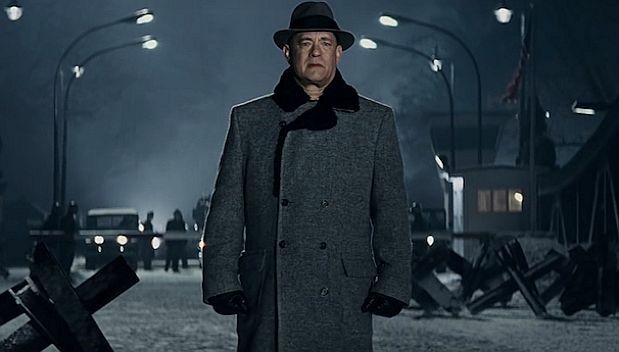 Mark Rylance (as Rudolf Abel) and Tom Hanks (as James Donovan) in Bridge of Spies. Near the conclusion of Steven Spielberg’s recent film Bridge of Spies, lawyer James Donovan (Tom Hanks), on a train that takes him from East to West Berlin, looks out in horror at two individuals being shot at the recently built Wall. The scene instantly recalls John le Carré’s 1963 novel, The Spy Who Came in from the Cold, and its 1965 Martin Ritt film adaption of the same name that begins and ends with corpses raked with bullets. Moreover, both films are drenched in atmospherics: the washed-out bluish cinematography of East Berlin in Bridge is similar to the black-and-white desolation and soullessness of the earlier film. The cinematography in The Spy suits the cynicism and betrayal inherent in the plot. Similarly, the visual representation of East Berlin in Bridge compliments the cold desolation of a police state that looks more like war-devastated 1945 Berlin than 1961 West Berlin. There, however, the similarities end. The contrast in the cinematography between East Berlin and a sunlit Brooklyn is one indication of how Spielberg offers a glossy, more upbeat, interpretation of the Cold War. It is also hard to imagine him including an American official uttering anything like what Control, the head of Circus (an amalgam of MI5 and MI6) says in The Spy to his agent Alec Leamas: “Our policies are peaceful, but our methods can’t afford to be less ruthless than those of the opposition, can they?” Or later when Leamas says to the Communist idealist, Liz Gold (played by Nam Perry in the film): “What do you think spies are? .... They're just a bunch of seedy, squalid bastards like me.” Adam Sisman in John le Carré: The Biography (Bloomsbury, 2015) reveals that the cynicism infusing le Carré’s novel – we are no better than them – reflected the unhappiness in his personal and professional life. Feeling trapped in his marriage, agent David Cornwall (before he became le Carré) was also disgusted by the number of former Nazis courted by British intelligence during the Cold War, and he had to work with them. Yet in the anger that he channelled into The Spy and subsequent novels, le Carré reveals insightful truths about the soul-destroying work of spies and raises questions about the damage that can be done to a free society by the methods that are carried out by the security services, questions that remain relevant today. Spielberg serves up the story of an upright insurance lawyer, James Donovan, who is commandeered in 1957 to what everyone hopes will be a pro forma defence of British-born Soviet mole, William Fisher. 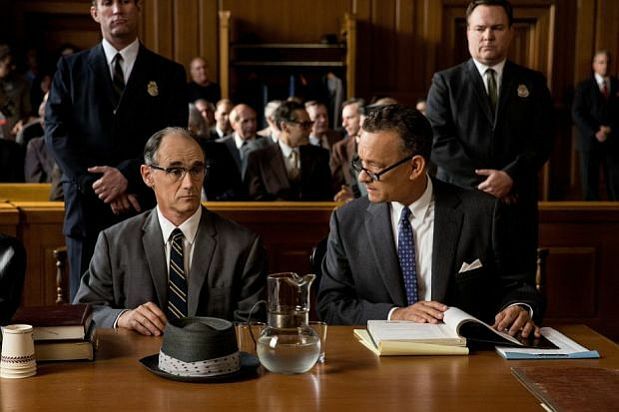 In Bridge of Spies, he is identified by one of his aliases, Rudolf Abel (played with a non-emotive performance by Mark Rylance that deservedly won an Academy Award for best supporting actor). A few years later, Donovan is tasked to arrange a swap of Abel for an American spy, Francis Gary Powers, who was captured and sent to prison for ten years after his U-2 plane was downed by Soviet airpower. Complicating this exchange is that Donovan also seeks to extricate an innocent American graduate student, Frederick Pryor, from the clutches of the Stasi, the East German security force. Throughout the film, Hanks plays Donovan with steely-eyed determination, surprising everyone by vigorously pursuing both his legal and diplomatic missions despite the unpopularity he incurs from his corporate colleagues and the public for defending the “traitor,” Abel, and the risk to his personal safety in mediating a complicated swap in the minefield of East Berlin. I recognize that some critics have faulted Hanks for being too noble and reprising performances of Jimmy Stewart or Spencer Tracy, but I believe that Hanks captures Donovan’s essential decency and urbanity, and his firm belief in “the rule book,” aka the Constitution. Donovan exudes these values in his 1965 insider account,Strangers on a Bridge: The Case of Colonel Abel and Francis Gary Powers, a book that Scribner reissued last year with an excellent Foreword by former CIA operative and current writer of thrillers, Jason Matthews. One key sentence carries special resonance: “every man, however despised, is entitled to counsel and a fair trial,” a principle that elicited personal abuse when he was called “Commie” to his face, even though he was a Navy Commander during World War II and helped to prosecute Nazi war criminals at the Nuremberg trials. Donovan’s recollections were the major source material for the screenwriters, Mark Charman and Ethan & Joel Coen. There is little evidence that they consulted the 2010 nuanced study, Bridge of Spies: A True Story of the Cold War, by Giles Whittell perhaps because the author spends relatively few pages on Donovan, focusing more on the legal and political context that involved Fisher and Powers. Had the film writers paid more attention to Whittell, they might have written a better script that more accurately reflects the historical realities. But then the film might not have been an exciting crowd-pleaser. At the outset, I should say that I am not such a purist that I believe that a film must or can be an accurate rendition of reality; neither a documentary nor an historical book can convey the full truth. All media will be selective in what is presented depending on the questions raised, the interpretation of the available evidence and the perspective of the filmmaker or historian. A film will always have some invented dialogue, certain characters will represent multiple individuals and events, and details will be altered or juiced to provide more dramatic import. For example, Donovan never saw individuals at the Wall being shot but heard about such happenings. Shots were never fired through the window of the Donovan home, although in his account he mentions that he had to acquire an unlisted phone number because of abusive night calls. The shooting scene is understandably included so that a police officer can vent his outrage at Donovan for defending a “traitor,” even though Donovan correctly asserts that Abel is a foreign soldier, albeit a spy. Donovan was never assaulted by hoods in East Berlin who steal his coat. That scene was likely included to amp the menacing atmosphere of the place, and catching a cold only enhances his doggedness to expedite his task quickly so that he can go home. I do not have much difficulty with these relatively minor deviations from the historical record because the details do not violate the historical spirit of the times. Tom Hanks in Bridge of Spies. But did the writers really need to gild Donovan’s lily as the film’s conscience by having him work at cross purposes with a C.I.A. operative, portrayed as not only uninterested in including Pryor in the spy swap but also threatening to undermine Donovan? In the wrong place at the wrong time, Pryor had been arrested for economic espionage by the Stasi (on the basis of his dissertation, a copy of which was found in his car) and spent six months in prison enduring repeated interrogation. When the C.I.A. operative utters “don’t go Boy Scout on me” or accuses Donovan of being a “bleeding heart,” I wonder whether the writers were aware that some of their characters are beginning to sound like those from a le Carré novel. None of this occurred: in fact, Donovan was encouraged by the government to secure Pryor’s release. Larger, more significant distortions and omissions diminish the film. Spielberg is primarily concerned with developing the relationship between Donovan and Abel and their evolving mutual respect in which the lawyer considers the spy in Whittell’s words, “extraordinary and brilliant.” But this focus, as interesting as it may be, comes at a price. Spielberg does not seem to be interested in exploring whether Abel did real damage to national security. Part of the problem is structural: does Spielberg primarily want to present a legal drama about an espionage case or a political spy thriller with geo-political ramifications? He ends up directing a mishmash that shortchanges both genres. A viewer without knowledge of the Abel case would not know that a trial – in which witnesses were called – did occur. What Spielberg merely shows are hearings in the judge’s quarters where Donovan’s procedural and constitutional arguments are summarily dismissed because everyone except the accused and his lawyer are only concerned about expediting a quick conviction and a death sentence. Were screenwriters not aware that their script of Abel’s trial, which only gives the appearance of due process, comes close to mirroring Powers’ later show trial in the Soviet Union? Only when Donovan raises the prescient political question, made privately to the judge in his home, that a death sentence would deprive the government of a bargaining chip in arranging any future swap of a Soviet spy for an American spy, does he receive serious consideration. Although Whittell ignores this moment, Donovan does acknowledge it in his own account, even quoting his own words, an instance in which history and drama nicely cohere. 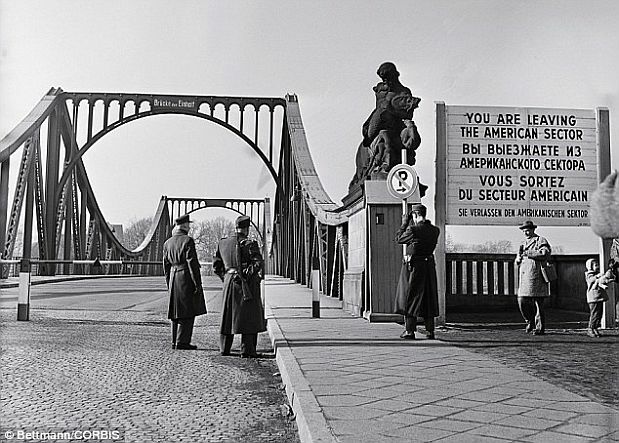 The Glienicke Bridge, West Berlin side. Had Spielberg dramatized the historic trial, it would have featured a parade of incompetent prosecution witnesses, one of whom was Abel’s assistant, an alcoholic, undisciplined spy who brought attention to himself by fighting with his “Soviet wife” in public places, and fearing his recall home to the Soviet Union, turned himself into an American embassy and betrayed Abel to the authorities. The evidence that these witnesses presented was pathetic and Donovan had no difficulty shredding their testimony in his cross examination. Had audiences had the opportunity to witness these proceedings, they might have wondered whether Abel was a security risk. They might have even endorsed Whittell’s later assessment that the prosecution failed to demonstrate that he actually stole or transmitted a “single secret of any kind” in the nine years that Abel spent in the US. Had the trial been re-enacted, the drama would have been more interestingly complicated, given that a guilty verdict, as in Powers’ show trial, was a foregone conclusion. The spy thriller component is even more unsatisfactory to a large extent because Spielberg in directing an apolitical film does not seem that interested in developing the role of Powers, whose capture is primarily a vehicle for arranging the exchange for Abel. As a result, Austin Stowell ends up delivering a bland performance. Those sequences largely communicate the perception that if the pilot’s plane were ever shot down, under no circumstances should he, a spy, survive. Against the odds, he does elude a direct hit, is captured and put on trial. Not shown was how he is paraded before the world’s cameras and how he embarrassed the Eisenhower administration, depriving it of a plausible explanation: that one of its pilots accidentally flew into Soviet territory, experienced mechanical problems and crashed. Instead, we witness a sleep-deprived Powers given a form of waterboarding – to offer a contemporary resonance – even though there is no evidence of Powers receiving abusive treatment. According to Whittell, Pryor was treated far worse than either Abel or Powers. 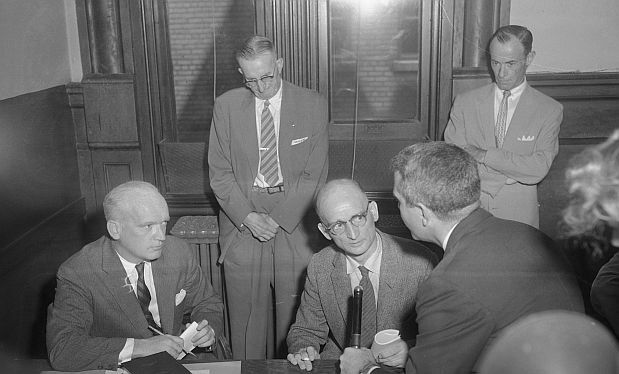 Even though we see subway riders reading the newspapers, there is nothing about the downing of the plane or the cancellation of an arranged summit conference between Eisenhower and Khrushchev that, according to a persuasive argument unspooled by Whittell, might have established a premature end to the Cold War. Spielberg abstains from incorporating newsreel footage or even conversation about the political fallout. Given this decision to omit the political dimension, Spielberg ignores Powers' public apology to the American government about the cancellation of the summit. Furthermore, in order to avoid offending certain political sensibilities, Spielberg does not include in his texts at the end of the film that President Kennedy refused to meet with Powers and that his brother, Robert Kennedy, the Attorney General, wanted to try Powers for treason. That inclusion would have been an audacious move. The only hint of official displeasure in the film is that the pilots refuse to acknowledge a distraught Powers. Readers of this review might conclude that I did not enjoy the film, but I actually did. I thought the film was engaging with some fine performances. I thought that Spielberg superbly choreographed the Abel-Powers exchange at the Glienicke Bridge that once separated West Berlin from Potsdam in the GDR and the delivery of Pryor to Checkpoint Charlie, generating suspense as to whether the deal could be successfully pulled off. My frustration is that I think it could have been a much better film had Spielberg and his writers made the decision to complicate the audience responses by offering a more historically subtle and an unabashed political film. It could have been more emotionally compelling and delivered disturbing truths worthy of a le Carré Cold War novel.